When you grow up in a house devoid of male influence, there are subtle nuances of the male condition that often go untaught. How to handle yourself in a schoolyard fight, how to use a disposable razor and how many times you’re supposed to shake after going to the bathroom were concepts I didn’t have a solid grip on until well after I had a bloody nose, a patchy beard and a pant leg infused with the unfortunate tang of asparagus piss. 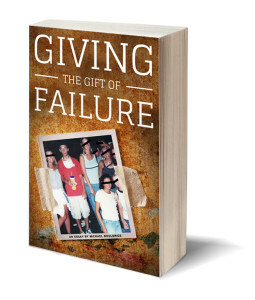 Michael Boulerice’s special brand of self-depreciating storytelling continues in GIVING THE GIFT OF FAILURE, the third installment of his Kindle essay series. Recounting his flailing attempts at high school romance, Michael takes the reader on a painfully comedic journey through juvenile lust, accidental mosh pits, emotional inadequacy and a particularly nefarious special needs student, all before dropping us off at home with the comforting notion that everything we’re worried about in our own lives is going to be alright after all. Well, certainly got some great insight into what it's like to be a teenage boy! Ha! Great nostalgia piece (loved the music references) and fun, funny (but also touching) read. I love this author's writing style and can't wait to read more!